The Houston Museum of Natural Science started small. Back in 1909, when the museum was founded, you could probably see everything we had to offer in 30 minutes. But since our opening, HMNS has been growing exponentially. These days, our main campus is the heart of an international network, bringing exhibits and lecturers from places like England, Egypt, Italy, and China. To see everything here would take at least two days, and that figure doesn’t even account for all there is to see at our Sugar Land campus or the George Observatory. Trying to decide what to do can be overwhelming for guests, but luckily, our staff has evolved alongside our institution. 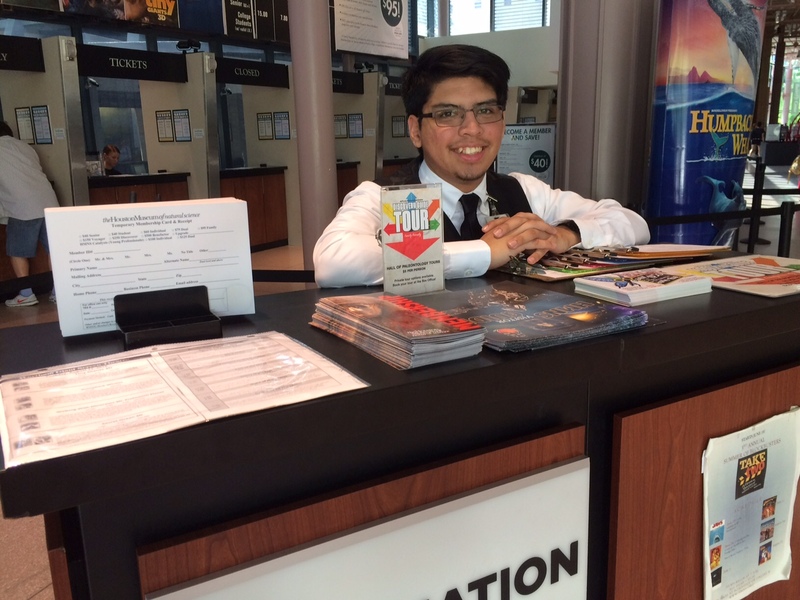 Concierge Rigoberto Torres enjoys being the first to greet visitors to the museum, he said. “Once they come inside, we want to make sure their experience is good from the start.” Photo by Jason Schaefer. The concierge service here at HMNS is like a mini travel agency whose services are free. All you have to do is walk up to the information desk, tell us what you’re interested in and listen to suggestions. It may seem like overkill, having staff just to explain what there is to see here, but consider this: our main campus covers four city blocks and contains 12 permanent exhibits and an ever-changing number of limited engagements visiting from all over the world. We also host a lecture series, adult education classes, multiple children’s education programs and much more. We have really interesting stuff, but it’s surprisingly easy to miss out. Some visitors see the concierges standing at the information desk or sometimes patrolling the exhibits, and they don’t know what to think. Who are these people dressed in white shirts and black pants? They may look somewhat like used car salesmen, but they really aren’t here to sell anything. They’re here to help. Some members of the team have been with the museum for years, and they know the ins and outs of every department, so they can answer questions about membership, ticket sales, upcoming exhibits, you name it. Concierge Rich Hutting explains to visitors Jullie Fugitt and Roy Hey why this Uintatherium might have looked so strange. She developed many different adaptations all at once. Photo by Jason Schaefer. Some of the concierges, called Discovery Guides, offer tours of the exhibits. Every day, the Discovery Guides take groups through our two most popular exhibits, the Morian Hall of Paleontology and the Hall of Ancient Egypt. Each guide has spent countless hours studying the objects housed in our collections. The little plaques in the exhibits give interesting information, but the juicy details, the romance and intrigue, the struggle for life and limb… those you can only hear on the tours. Corey Green explains illness in Ancient Egypt to a tour group of children. Egyptians used makeup to prevent flies from getting into their eyes, she said. Even men. Photo by Jason Schaefer. 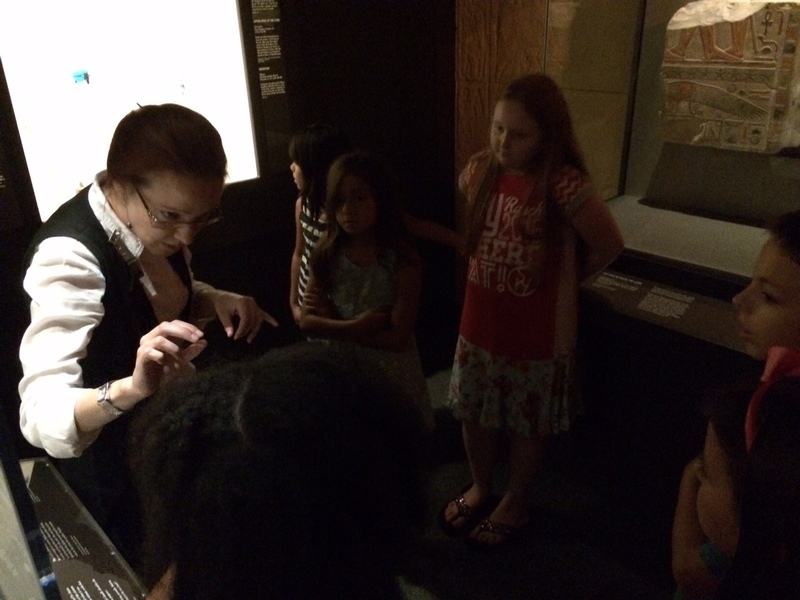 Discovery Guides give interactive kid’s tours, too, where the children get to touch real fossils. On these special tours, the guides manage to explain what fossils are and where they come from without sounding like an audio version of paleontology textbook, so children and adults alike can walk away with a real understanding of the things in our exhibits. The concierge team is blazing a trail toward providing better service to all who visit us at the Houston Museum of Natural Science. Already, letters have come in calling us sweet and helpful, giving every guest the best experience possible. We are proud to offer a service not found in most other museums. A service that ensures there will be none of those awkward family photos where everybody looks tired and confused. Not when they’re at HMNS. 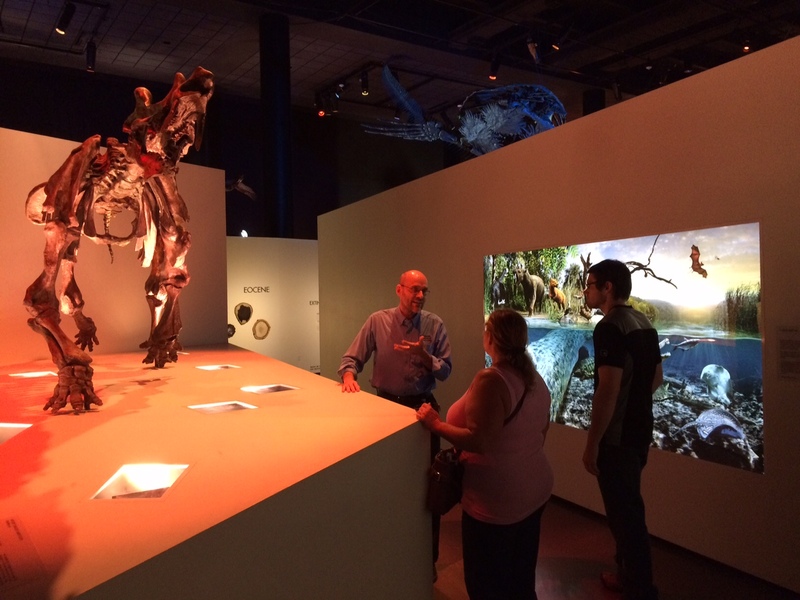 Editor’s Note: “Cretaceous” Chris Wells is a Discovery Guide at the Houston Museum of Natural Science.